Samsung 860 Evo SSD latest firmware? Discussion in 'Storage Drives' started by IggyStooge, Nov 9, 2018. Location: Somewhere, in a field in cheshire... alright! Magician doesn't work on my system so I can't easily check for latest firmware. I tried finding it via google to no avail. I have version RVT02B6Q currently. Can anyone tell me if this is the latest available firmware version please? Why does Magician not work? It installs and works but does not recognise the 860 Evo correctly so isn't much use really. I contacted Samsung and they suggested numerous things to get it to recognise the SSD but nothing worked. Fortunately I installed Magician on an older system and when I connect the SSD to that system it recognises OK. I was hoping not to have to take the SSD out of this PC just to check if I have the latest firmware. You can check what firmware it's using through device manager. Located your device in the device manager go to the details tab and one of the drop downs might contain the firmware version. At least that's what's visible for my Crucial SSD. When I turn it on I'll have a closer loo to see which drop down it is. I couldn't find it where you suggested. Can you let me know please if you find it? 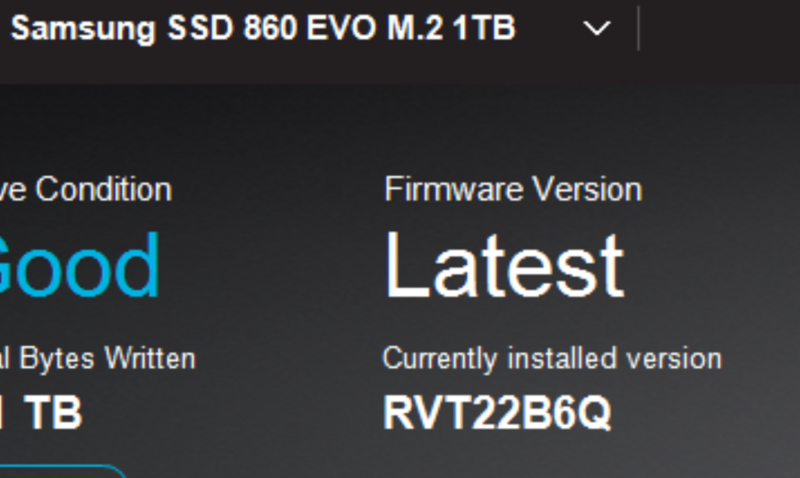 I've just read that it should be under Hardware IDs in details but I don't see anything like the firmware version on the Evo 860. Won't this only tell me the version I have currently anyway? I need to know if it's the latest version. Maybe Samsung doesn't show it there. On my crucial I could see the firmware. You need to figure out why the magician software doesn't recognise your SSD. I've tried on clean installs of windows with various versions of Magician as they've been released. I'm on an old system no doubt but Magician works on an even older system I've got. Please be informed that the model ID of your SSD is not correctly displayed. 4. After changing SATA model from IDE to AHCI and re-install OS again, Mount SSD at other port. Thanks for that ScottyBee. I need to update then. Mine isn't the M.2 version but I assume it will have the same firmware? I still got the same message in AHCI. So I left the problem alone for awhile and today (Dec 7 2018) I opened magician again and clicked on the "I" to see if there was a newer version. I had version 5.3.0 installed, but the software found and installed a newer version. After rebooting, it immediately recognized my drive and I was able to update to the newest (rvt02b6q) firmware. The weird thing is that the software still shows up as version 5.3.0. You might try "updating" magician because it fixed the firmware update issue for me. Now it shows my drive supported but it still only benchmarks about half the speed I should be getting. I'm assuming that's because I'm in RAID mode and not AHCI. Otherwise, so far I can't find any information on what the firmware changes or fixes. I'm running the standard 2.5" SATA version of the 860 EVO 1TB and just used Samsung Magician to update to the latest firmware. For me, it's shown as RVT02B6Q (updated from RVT01B6Q), so I'm guessing the M.2 models have a different firmware? I can't find any patch notes for the release, which is annoying. Your forum post and one other German forum post seem to be the only related results. I never normally update unless I know exactly what it entails (and what sort of errors other people have hit) but I kind of "accidentally" updated it this time - clicked the 'Ok' button in the hope it would give me the patch notes as preamble before confirming a second time, but nope - it just went ahead and immediately applied the update. Thanks. I'll try that ToadeR.